Sons of Anarchy has had a long and gritty run as part of FX’s lineup. The hit program wrapped up its most recent season quite a while ago, with the Season 5 finale airing way back in December of 2012. Amazon has had the set available for pre-order for a little while, but it took a while for Twentieth Century Fox Home Entertainment to make the set official. This week, the company finally announced the official Blu-ray and DVD release, which will hit shelves on August 27. Sons of Anarchy follows a crew of motorcyclists known as the Sons of Anarchy Motorcycle Club, Redwood Original (SAMCRO). They're an organization known for its rough-and-tumble attitude and aversion to the law. The gang often spends time during episodes dealing with the antics of various members as well as threats from rival gangs, and Season 5 takes these fights to a new level, with wild plotlines including gang members being framed and home invasions turning turf fights into bloodbaths. Sons of Anarchy is a favorite at the network. Early in 2012, showrunner Kurt Sutter signed an overall deal 21st Century Fox TV and FX Productions. At the time, as part of the deal, Sons was guaranteed for a sixth season at the network. In addition, a seventh season is likely. So, if you have always wanted to be a fan or need to catch up on the series, you’ll be in no danger of running out of episodes in the future. One of the show’s strong suits has always been the graphic nature of the art design for the series. 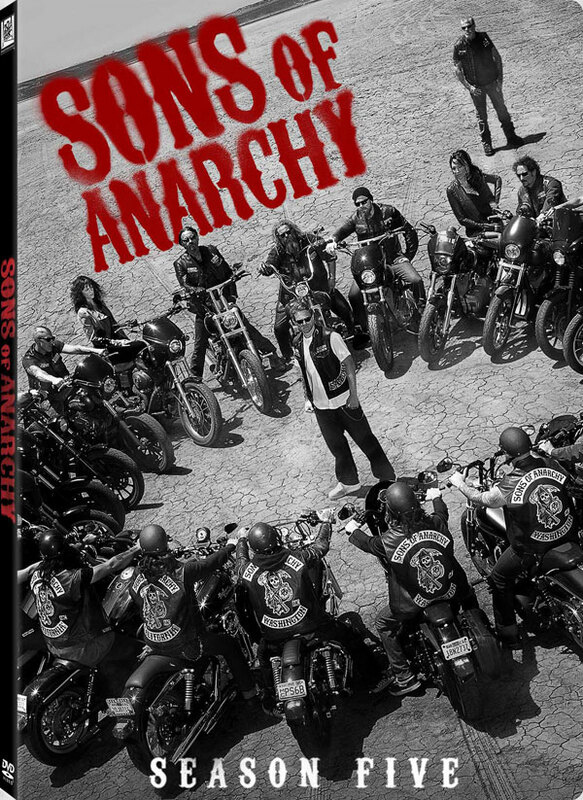 The Season 5 cover art actually uses a promo still from the season, that I particularly like, which features a ring of motorcycles against a barren landscape. For some reason, the image always gives me the heebie jeebies, which is perfect for a show like this. I wish I could be as enthusiastic about the bonus features with the set, but it looks as if fans will be getting a real hodgepodge of extras. Some of the extras we’ve come to know and love with Blu-ray sets, including deleted scenes, audio commentary, and a gag reel. However, there will only be two commentaries available for a 13-episode set, and some of the other extras just look weird. Maybe it’s just me, though. You can check out the full list of bonus features, below. Unfortunately, FX hasn’t officially announced when Sons of Anarchy will be returning to the schedule, but with Drea De Matteo and CCH Pounder already signed on for the new season, and with the Blu-ray and DVD release hitting homes later this summer, fans should be in for an early fall release date. As soon as FX announces the release date, we’ll be sure to keep you abreast.